One of the first challenges facing the City Council in their first wartime meeting on 14th September 1914, was the urgent need to find work for those people who were suddenly thrown out of their previous employment by the war. The parks Committee contributed such tasks as: “Filling up and preparing banks in King Edward Park for planting” and “Excavating and levelling a portion of the free playground at the west end of the Forest”. One of the most significant ways in which the parks contributed to the war effort was via fund-raising concerts. Beneficiaries included the Relief for Belgium, English Prisoners in Germany and Wounded Soldiers concerts. These band concerts can also be seen to have supported the war effort by supporting and boosting morale on the home front and providing appropriate entertainments. Notts. Patriotic Fair, Whit Monday, 1917. The Forest – which encompasses more than eighty acres –was used for military parades and inspections. It could also be used as a gathering point for marches, such as the 3rd Line Depot (Robin Hood) Battalion Sherwood Foresters were inspected there in June 1915. The Forest also found itself used for bayonet practice by the Nottinghamshire Volunteers Regiment which involved erecting a wooden frame from which bayonet fighting sacks were hung. The 17th Sherwood Foresters Battalion asked for “ground locally, for digging and trenching” and this was granted in part of Bulwell Hall Park. The Parks Committee rented out Bulwell Hall and its stables to the War Office and a number of different military groups were stationed there throughout the war – although the tenant of the Hall, was allowed to retain the living rooms on the ground floor of the Hall. A Mechanical Transport Column were stationed there in May 1915. They requested from the Parks Committee “permission to apply to Magistrates for a temporary beer licence … during limited hours each day”. The Committee kindly acceded to this request. The Mechanical Transport Column didn’t stay long and were soon replaced by a North Midland Division of the Royal Field Artillery which some annoyance as in November 1915 it was reported that “some of the Soldiers stationed at Bulwell Hall had recently cut down several trees in the Park”. 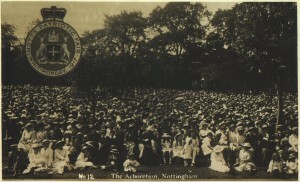 In September 1917, even the Arboretum Refreshment Rooms were earmarked for military occupation by the WAAC – the Women’s Army Auxiliary Corps, Headquarters. In 1915, the War Office made an offer of captured German guns but this was deferred until after the war. However, a Mr S. P. Derbyshire wrote to the Parks Committee in September 1915 to offer them an ‘Inca Canoe’ supposedly captured from a German ship. After the war, a number of captured guns, a tank and other military trophies were displayed. But by the end of the 1920s, these were removed and the broken down for scrap. 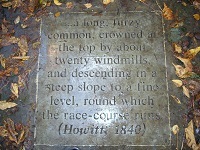 Cricket and football pitches continued to be used, especially on the Forest, but at times the teams were made up entirely of military personnel. One such match took place on the Forest between patients of the Berridge Road Military Hospital and a team from Bagthorpe Military Hospital. Meanwhile, Victoria Park acquired a shelter ‘for use of soldiers attending open-air classes’. RESOLVED that the attention of the Education Committee be called to the great inconvenience caused by the establishment of the temporary open air school in the nursery grounds and that they be requested to consider the question of providing accommodation for such open air schools outside the Arboretum. A copy Circular, issued by the Education Committee to head teachers of schools, with the view of preventing disorderly conduct by scholars using the various grounds was laid before the Committee. As the war drags on, the Parks Committee are asked to accommodate the needs of wounded or infirm soldiers in Nottingham. A number of ‘Seats for Wounded Soldiers’ are set up in various locations with notices that “wounded soldiers only are allowed to use the seats”. Some of these seats placed near streets, proved hazardous in the blackout requiring that their sides to be painted white. Once the hospital trains with wounded from the front began arriving in Nottingham, their numbers soon outstripped the capacity of Nottingham’s hospitals, so smaller military hospitals were established, many of financed by the wealthy benefactors, in large houses around Nottingham. One of these, a new Home for Paralysed Soldiers was located opposite one of the stepped entrances to the Forest. The City Architect was called in to replace the steps by a ramp “to enable invalid chairs &amp;c. to enter the Forest”. By 1917 the people of Nottingham were facing all kinds of shortages. A Local Food Control Committee attempted to co-ordinate supplies. In January 1917, for example, the Parks Committee offered 50 acres of land at Bulwell Hall Park for the cultivation of potatoes and other vegetables, if required. Other lands were also used for food production. To celebrate the end of the war the City Corporation organised an official celebration, held on 19 July 1919. Bands played in all the parks.